Before I talk about WisCon 41, I wanted to address a few administrivia-related bits. First, a shout-out to Michael Matheson. 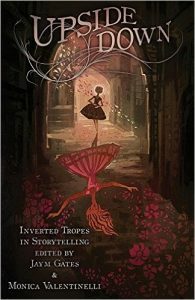 Michael’s short story “Until There is Only Hunger”, which appeared in Upside Down: Inverted Tropes in Storytelling, was longlisted for the 2017 Sunburst Awards. Huzzah! Second, if you’re in the mood for clicking around the internet, check out the Ropecon 2017 Guests of Honour page as well. 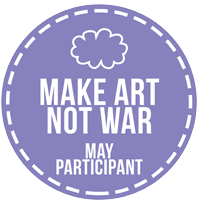 And, lastly, if you’re expected a Make Art Not War 2017 check-in, I’m postponing that until tomorrow so I can announce June’s theme and do my month-end recap. Most of my WisCon 41 recap will be general, rather than specific, because I had so many conversations with several talented individuals that I lost track of the awesome. I plan on featuring some folks for upcoming installments of my Friendly Friday posts, and I’m sure you’ll enjoy checking out their work. First things first: I know that the backlash I experienced as a result from my withdrawal as a GOH from OdysseyCon was a concern for many people for a number of reasons. In that regard, I felt that WisCon 41 staff went out of their way to ensure that I was okay and was not harassed in any way shape or form. Staff was apprised of the situation, con safety volunteers were clearly visible, and all checked in on me from time to time. Several friends and attendees did as well, and I felt the people I’d never met before who approached me were very respectful. Attending WisCon turned out to be a good experience for me, because it definitely lessened my anxiety prior to my summer conventions. I was asked: “Would I ever go back to Odyssey Con?” At this time, my answer is: “I don’t know.” While I won’t go into the private exchange, I did send an e-mail on April 12th to Odyssey Con that has not been answered to address what has happened and (hopefully) prevent such mistakes in the future. As a result of this, however, my thoughts on what it means to be a creator at a convention are turning out to be more complicated than I expected. My experiences with celebrity guests (e.g. authors/artists/actors, etc. who are paid to be at an event, either through the studio, publisher, or via the convention) has always been to regard those occurrences as work. This is why many celebrities (or their representatives) sign a contract that clearly spells out what’s required of them. While I do not regard myself as a celebrity, I have attended conventions either with or on behalf of publishers. I also have a teeny, tiny amount of fame that I actively maintain to publish more and engage with fans, so in my mind I’m a micro-celebrity. Regardless, the word “celebrity” is definitely a type of job in my mind, and even if creators like myself touch upon an aspect of this role in our careers it still should be considered work. This is where my feelings tend to be more complex. Not only are so, so, so many of us are untrained to deal with being in the public eye and all that it entails, both positive and problematic, many creators aren’t paid to perform that work nor does everyone regard it as such. Some creators attend conventions to have fun and, because they’re having a good time, don’t think of it as a job. Like many, I often pay to attend conventions out of pocket, and I have to make a decision whether or not that money will be well spent. Unfortunately, it’s only when an appearance turns sour that missed details suddenly become more important. Why didn’t a con, for example, think to ask a creator if they had an issue with a stalker, preemptively ban/have processes in place to deal with someone who’s been reported multiple times over, or plan downtime so creators aren’t on six panels in one day? I think, here, the answer is that perhaps some volunteer-run cons don’t regard what they do as work, and wind up underestimating what it takes to put on a good show. Whether you’re a volunteer or not, planning a convention is definitely requires lot of labor, and often conventions are formulated as a business entity or LLC to accommodate the financials and business decisions attached. So, in my mind, there was never a question that conventions were, in fact, work; it’s true that I’ve struggled with what my role as a participant or attendee was over the years, because varying degrees of professionalism are often present at conventions and it can be hard to know where you fit or find people to hang with. As a guest, however? That, to me, is not just an honorific, but a specific role that comes with expectations attached for both parties. Perhaps treating guests and panelists through a contractual lens, similar to how some celebrities deal with conventions, might be one approach to address concerns ahead of time? I’m honestly not sure. The other thing I realized, is that my life as a creator has gotten considerably harder since 2014. The last couple of years have absolutely been challenging both privately and professionally. I do not get paid to be harassed; I get paid to write and deliver on time. “Just get offline” doesn’t cover damages caused by less PR/engagement given my current visibility, picking up the pieces after getting doxed, making sure social accounts are locked down, and the toll it takes on you emotionally. That time spent is the hidden cost of harassment; it becomes all that much harder to network, find work, remain enthusiastic, and fulfill obligations. This, being a creator, is my job and it’s one where I only earn money if I complete my obligations on time in a quality folks expect. Right now, work is all I can think about. “Just get offline” is not a solution, and neither is “find another job.” This is my job, I love it dearly, and I’m not abandoning the tools I need to utilize in my career. I would really appreciate it, however, if being harassed wasn’t an expectation or a baseline threat. And, if it is going to be this way both now and in the future, then let’s talk solutions. Let’s talk about training and mentorship to help others through this so they’re prepared if and when something happens to them. Let’s remind ourselves that all creators are working, and being treated well shouldn’t matter whether we’re super-famous or not, and our jobs/livelihoods are at risk. Lastly, let’s continue to find ways to have fun with the fans who do appreciate and actively support us, too. Isn’t that why we’re here? Shifting gears… (Hey, I did warn you this post was going to be long and rambling.) WisCon 41 took on a special meaning this year given its emphasis on feminism, building communities, literature, and fandom. The death of Carrie Fischer and the loss of long-time attendees, when coupled with the rise in racist attacks and totalitarianism, is a lot to process through one-on-one conversations and panels. It was needed, and it was often emotional. I also spent a lot of time touching base with peers and friends, and heard their stories and news, both good and bad. Now, I feel like I’m a bit hungover–but in a good way. I want to emphasize the word “stories” here again, and not just because there are so many authors at this convention who hailed from a diverse range of backgrounds. I believe that everyone has a story to tell, and WisCon reinforces that in many ways. Time and time again, the themes that propagated through the panels and discussions that I had was the importance of being open to failure, that representation is additive and not subtractive, that protesting and standing up for what’s right has costs associated with that and not everyone can participate or voice their frustration in the same way. Often, especially online, there’s a pressure to be right, to be heard, to know everything there is to know about everything–but that’s impossible. We cannot know what it’s like to fill the shoes of everyone else, because the ability to research is not a replacement for the necessity of experience. Sometimes, the only way to learn is to listen. Other times, we may not be able to internalize what it’s like to have a different identity–and that’s okay. Sometimes, the idea that not everything is ours to take can feel a bit limiting. I don’t agree at all. By recognizing what stories aren’t ours to tell, we can focus on what makes each of us unique as individuals and sharpen our own voices. This makes our writing better! (Oh, I’m not perfect and I feel like I’m always learning. To me, that’s all part of the gig.) What WisCon 41 reinforced for me, however, is that sometimes listening is an act not only of compassion, but of empathy and a willingness to step aside and hear someone else’s story. There is a lot of power in the ability to listen, and I have to wonder if we’re afraid of what we’ll hear. Mind you, I’m no sage. I don’t know what the future will hold, and I don’t think anyone else does, either. What we can learn from, however, is the experiences of those who have come before. So much static history is lost, and remains undocumented or fragmented. Shows like this are important so we can listen to living bits of history, and remember that we are not alone in our daily lives, in our struggles, in our fandoms. That rich fabric of intersecting narratives, when coupled with the many talented authors, editors, and artists present at this convention, gives me hope. That’s a pretty damn cool feeling to walk away with, and I can’t wait for what’s to come. Lastly, I want to give one final shout-out to how amazing the guests of honor, Kelly Sue DeConnick and Amal El-Mohtar, are. If you haven’t had the opportunity to check out their work, please do so. There is nothing more fabulous than being able to congratulate them on their success, and I’m certain both will continue to be icons in their fields. They are incredible, lovely people, and I wish them well. Huzzah! Caffeinated Beverages Consumed: More than I needed, but less than I care to admit. Movie/TV Show Last Viewed: La Belle et la Bete. One of the things that I love about tarot cards, is that there are so many different ways to represent the images in a deck. I collect them and, of all the decks I have, one of the most unusual and beautiful is the Prisma Visions tarot designed by James R Eads. The Major Arcana image of The Magician doesn’t do this deck justice. James is known for playing with light, and his style really shines through in a tarot deck. What’s really cool about the Prisma Visions tarot, besides the silver edging and the lovely box, is that each suit has also been illustrated as a panoramic piece. To see all four suits illustrated in their entirety, James offers full-size panoramic prints. I have a smaller print of the Ace of Swords, and I love the quality and theme he uses to breathe magical life into the suits. 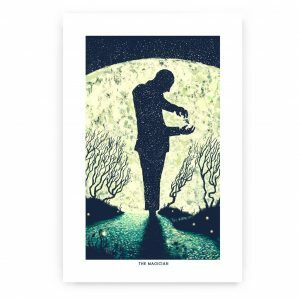 In addition to the Prisma Visions tarot, which is the second deck he’s designed, James also offers prints and stickers of his illustrations as well. If you dig his art, you’re not alone! James also creates beautiful posters for bands and other gigs, too. He has a lovely portfolio, and I’m glad I have a little piece of his talented works. If you’re interested in this artist, visit the official website of James R Eads or follow James R Eads on Tumblr. Caffeinated Beverages Consumed: There’s really no point counting while at a convention. Movie/TV Show Last Viewed: X-Men Days of Future Past. Running at a million miles an hour this week, but I wanted to drop in with a quick tip about a way to reboot if you’re stuck. In a word: silence. I know that it may seem mundane or stupid or even boring, but silence for five minutes can make a world of difference. For me, it wasn’t the silence that was the issue, it was discovering what “noise” meant. Noise. Twitter, Facebook, Instagram, the news, text messages, Skype, etc. That, when combined with everything going on during the day, that adds up. Though it’s typed information, words you read can still translate into noise that gets into your brain space. Sometimes, in order for ideas to percolate, you need the freedom to think. That, unfortunately, is a luxury artists don’t always have. Between day jobs and families and pets and… Well, you know how busy your life can get and how that can interfere with your ability to think! To reboot, I recommend intentionally recreating a space where your mind has the chance to rest. I go for walks, and don’t bring my phone with me. Other times, I use noise-cancelling headphones and sit in total silence for five minutes. You’d be surprised how short periods of silence can help calm you down, give your brain a break, and allow your creativity to blossom. Next time you’re feeling stressed out and can’t find the inspiration to make art, give it a try! I am happy to announce that I am a guest of honor at Ropecon in gorgeous Helsinki, Finland in July. I am thrilled to be heading over to Finland for the first time. The convention website is awesome! Check out the pictures from Ropecon, which includes a lovely set of cosplayers. The work they put into dressing up never ceases to amaze me–there are some fantastic photos! Can’t wait to share more details with you as the planning comes together. See you in Finland! Don’t forget your dice!